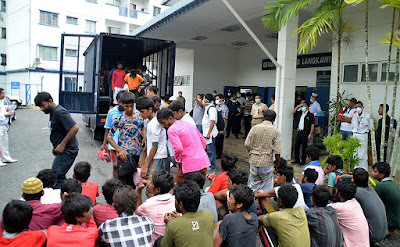 KUALA LUMPUR: The Immigration Department has launched an investigation into allegations that Rohingya detainees in its depots are badly treated and poorly fed. A department spokesman said a contractor appointed by the Home Ministry is in charge of distributing food at immigration depots based on strict guidelines. "Each detainee is given food and drinks four times a day. "Detainees can also approach the officer on duty to ask for additional food and drink," the spokesman said in a statement Wednesday. A thorough investigation is also being conducted on allegations that certain officers used force on the detainees. "We will not hesitate to take action if the investigation shows that the officers involved are guilty," he said. The spokesman added that the department would not brush aside allegations that there were a high number of deaths at the depots. "As a preliminary measure, medical assistants at the depots will conduct health checks on detainees sent to the depots by Immigration or other departments. "If any detainee has an ailment on arrival, we will send him to a clinic or nearby hospital for treatment. "Most detainee deaths at depots are due to critical illnesses or infectious diseases suffered by them even before they were sent to the depots," he said. A British newspaper, quoting the United Nations refugee agency, reported that at least two dozen refugees and asylum seekers have died in Malaysian immigration detention centres since 2015. It reported that inmates were living in fetid, overcrowded cells and deprived of basic necessities such as food, water, and medical care, in conditions that the Malaysian Human Rights Commission (Suhakam) described as "torture-like". The newspaper interviewed a dozen recently-released refugees, and each one claimed they saw at least one inmate die – most because of disease, but in some cases due to physical abuse.